An international conference entitled, "Afghanistan, Shanghai Cooperation Organization, Eurasian Security and Geopolitics," took place in the village of Choktal on the shores of Lake Issyk-Kul on June 11-12. Experts, politicians, and scientists from Afghanistan, Iran, Kazakhstan, Kyrgyzstan, China, Tajikistan, Uzbekistan, Russia, Germany, Great Britain, and Italy were present. Here is an official report on the conference, issued by its organizers. The Afghani crisis remains one of the central problems of the international community. The American counter-terrorism campaign encouraged terrorists, boosted production of drugs, illegal immigration, illicit arms deals, and fomented other threats that compromise the security of Afghanistan itself and other Eurasian countries. All of that necessitates actions by Afghanistan's neighbors who view the Afghani crisis resolution as vitally important. Hence, the attention of the Shanghai Cooperation Organization has been drawn to the problems of Afghanistan. Additionally, Kabul itself is interested in the involvement of the Shanghai Cooperation Organization in an effort to solve the problems plaguing Afghanistan. President Hamid Karzai's speech at the Shanghai Cooperation Organization summit in Bishkek in August 2007 was centered around such participation. The conference formulated a number of conclusions and evaluations, suggestions and recommendations that define the model of proposed participation of the Shanghai Cooperation Organization in an Afghani crisis resolution and future development of Afghanistan. The effectiveness of investment activity in Afghanistan is impaired by an absence of clearly defined objectives, plans, and even concepts of development for the country. The National Development Strategy presented at the conference in London is purely declarative and unconvincing. It lacks economic and scientific assessment of economic parameters and, also, the means of their accomplishment. This approach itself dooms all investment projects to failure. Meanwhile, the effectiveness of investments is sometimes jeopardized by political interests of certain donor states. It is possible for countries of the Shanghai Cooperation Organization to make better use of their investment capacities. They may concentrate on assistance to particular regions of Afghanistan or even on particular projects, bearing in mind their commonalty of interests (such as common borders, a common irrigation framework, identical methods of agriculture, interests in the socio-cultural and religious sphere, and a joint economic experience). This tactic will be better both for Afghanistan and its neighbors. The strategy of the Shanghai Cooperation Organization in Afghanistan should be focused on the concentration of investment efforts on a detailed plan of economic restoration of Afghanistan, and not on size of the sums invested in this country. - instruct the Contact Group to reach an agreement with principal donor states on joint actions facilitating rapid restoration of Afghanistan. The improvement of the economic situation is essentially the only solution to the problem of the Afghani crisis. Promoting long-term projects in Afghanistan, countries of the Shanghai Cooperation Organization should also carry out small short-term projects that will create jobs for citizens. It is deemed advisable to concentrate on restoration of the objects built by the Soviet Union and deliverance of necessities, equipment, and other mechanical facilities that do not require fundamental training and that are easy to use. - make the best possible use of trans-boundary trade so as to form economic cooperation zones on the border and therefore strengthen the buffer zone in the northern part of Afghanistan. Continuation of the conflict in Afghanistan poses a threat to the Shanghai Cooperation Organization, its members and observers alike. The threats stemming from Afghanistan, meanwhile, undergo certain transformations these days. The production of drugs in this country and their proliferation compromises the national security of the neighbors of Afghanistan and other Eurasian countries. Extremist and terrorist organizations have become noticeably more active. The danger that extremism and trafficking may merge one day creates a problem: trafficking is deployed as an efficient instrument of political struggle, while politics becomes criminal. Where Central Asian countries are concerned, the destabilization of Afghanistan jeopardizes their internal security. Getting stronger, criminal and extremist structures may aspire to join with the legitimate authorities and eventually disrupt regional stability. Reliance of Central Asian economies on trafficking poses another threat that warrants immediate attention. Most threats and challenges the Shanghai Cooperation Organization faces are trans-boundary. The so-called three evils (religious extremism, separatist movements, and international terrorism) easily penetrate state borders of the young states of the region. The scope of the problem makes its solution by any state alone impossible. The situation being what it is, the Shanghai Cooperation Organization should force individual responsibility on its members for efficiency of counter-measures on their borders so as to bolster internal security by establishment of a counter-terrorism security belt. It was stressed again and again at the conference that the strengthening of Afghani statehood within the framework of the Central Asian regional security maintained by its neighbors and other involved parties is in the interests of the Shanghai Cooperation Organization and NATO and the United States. International cooperation is always more productive than individual or bilateral efforts. The lack of cooperation between the Shanghai Cooperation Organization and NATO in Afghanistan promotes neither their nor other countries' interests. The matter should be elevated to the upper echelons of the Shanghai Cooperation Organization and handled there. As things stand, it is already possible to make use of the potential of the Shanghai Cooperation Organization and potentials of some NATO countries ready for a constructive dialogue in the name of cooperation and interaction. Participants of the conference recognize the importance of the part played by the international counter-terrorism coalition and NATO in the military containment of the Taliban and in the development of Afghanistan. Like all neighbors of Afghanistan, countries of the Shanghai Cooperation Organization wish NATO success in this country. At the same time, they feel that they are entitled to complete data on the effectiveness of counter-terrorism and counter-trafficking efforts. The United States' intention to have military bases in Afghanistan and Central Asian countries should be well-augmented. Also importantly, presence of US military bases there should promote interests of the host countries themselves and not those of the United States alone. Neighbors of Afghanistan and the Afghanis themselves know that the military presence of forces of the counter-terrorism operations will become history one day. Failure of the international coalition to improve living standards in Afghanistan may cost NATO and the United States what support in this country and abroad they still have. Neighbors of Afghanistan welcome its strategic partnership with the United States as long as this partnership is not aimed against them. If, however, Afghanistan is made a bridgehead for the American operation against Iran, this latter will certainly retaliate and turn Central Asia into a battlefield where a war will be waged on the United States and the international coalition. It disturbs the Shanghai Cooperation Organization, which is convinced that the government of Afghanistan, itself, should develop its own relations with its neighbors including Iran. The Shanghai Cooperation Organization may actually facilitate improvement of relations between Afghanistan and Pakistan. Confrontation between the United States and Iran and lack of cooperation between them in the Afghani crisis settlement are disturbing, too. Meanwhile, this cooperation proved quite effective during the period of hostilities with the Taliban in late 2001. Where NATO is concerned, it should initiate consultations over the future of Afghanistan with all its neighbors including Iran, Russia, China, India, and countries of the Persian Gulf. The conference agreed that it is necessary to encourage actions of the government of Afghanistan aimed to advance relations both within the country (with the Taliban, among others) and with the neighbors including Iran, Pakistan, and Persian Gulf countries. It should be accomplished both at the bilateral level and within the framework of the Shanghai Cooperation Organization and other international structures and coalitions. By and large, the Shanghai Cooperation Organization and NATO acknowledge the necessity to make Afghanistan and Central Asia part of the international community in such a manner that will prevent this region from being a den of international terrorism. 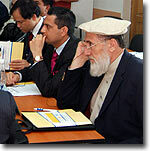 Negotiations between different ethnic and political forces is typical of Afghani society and state. The confrontation that regularly deteriorates into a civil war necessitates involvement of external forces in the process of the talks. These measures may be based upon precedents within Afghanistan itself (national reconciliation policy of the late 1980s) and abroad (Tajik settlement in the 1990s assisted by Iran and Russia). The Shanghai Cooperation Organization itself and its individual members and observers are experienced peacekeepers and intermediaries. The Afghani problem does not have a military solution. A constantly encouraged process of negotiations is needed, a process involving all Afghani political forces, state structures, ethnic communities, and religious leaders. Appearance of new political forces like the National Front of Afghanistan that abides by the law shows that this country has a considerable potential for a peaceful search for a settlement formula. Groups fighting the government and foreign military contingents are thoroughly heterogeneous. A great deal of them were formed in Afghanistan itself where they enjoy support among the population. These groups should be made fully fledged participants in the process of negotiations. Connection with international terrorist and extremist forces should be the only criterion for expulsion from the process. The Shanghai Cooperation Organization may become an initiator and guarantor of these talks. Its members and observers should pull all available strings and exert their clout with the Afghanis to have them suspend the hostilities and transform the Afghani political system in the interests of all strata of society and ethnic groups, without exception. Ferghana.Ru news agency is official information partner of the Issyk-Kul conference "Afghanistan, Shanghai Cooperation Organization, Eurasian Security and Geopolitics"